Since moving abroad, it's become blatantly obvious how little people know about our vast and awesome country. The international community often assumes that we must be just like the United States and while we gladly share more than just a border, nothing makes a Canadian angrier than being told we're practically American. (After all, you wouldn't tell a Norwegian they're no different than a Swede or a Scot that they have no culture apart from England.) We know that we don't do a great job of shouting our accomplishments out to the rest of the world but don't let our quietness fool you, we are fiercely proud of our country. Over the next few weeks, I've teamed up with some of my favourite Canadian bloggers, expats and travellers to share with you some things that are distinctly Canadian. In case you missed them... PART I and PART II. My absolute favourite travel show, Departures, may have ended in 2010 but it's beautiful cinematography sticks with me years later. The two hosts, Justin and Scott, along with their videographer friend, Andre, travel the globe, featuring authentic and interesting experiences from Canada, North Korea, Papua New Guinea, Brazil, Russia, Ethiopia, Mongolia and many more. For me, it's more than just another travel show, it's an art. Originally airing in Canada on OLN, I've seen it all over the world thanks to National Geographic picking it up. I'm looking forward to seeing Scott & Andre's new 13 part documentary, Descending, which premiered in 2012 on OLN. For those of you not in Canada, you can check out their YouTube channel here. Jeanie: Hello, my large rodent friend. Jeanie: Thanks for agreeing to meet with me today, I really appreciate it. Jeanie: No, no. Just a few quick questions. Beaver: Okay, let’s get to it. Jeanie: Well...how do you feel about being the reason that Canada became a nation? Jeanie: It’s true, European men were all sorts of nutso for the felted hat. Jeanie: How did this all transpire...your nearly two hundred years of fame? Beaver: My cousins in Europe went extinct because of the need for beaver furs; over hunted, eh? 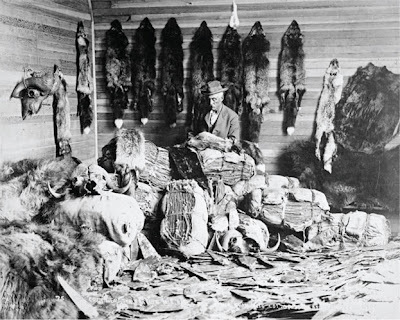 A French merchant heard that beaver pelts were being found in North America. Samuel Champlain was sent from France and he realized the business opportunities quickly. Jeanie: Ah, the French and their fashion. Beaver: No doubt, eh? As always, the Brits were right on their tails, trying to get a piece of that there action. Jeanie: Weren’t the First Nations People involved somehow? What was their take on it all? Beaver: Oh, sorry about that! I totally forgot about them. Jeanie: Seems a common problem. Beaver: Yeah well...of course the First Nations people were the ones who actually did the trapping of the animals. They knew the land and were very skilled at catching animals. They would trade the furs for European goods that made life easier; tin pots, knives, blankets, traps and guns. Of course, liquor was also a high commodity in the later years. Jeanie: Let’s leave that one alone...seems a touchy subject. Jeanie: Thanks for talking to me today. Beaver: No problem, mind if I get going? (standing up and pushing his chair back with a scrape) I’m getting a little long in the tooth. Jeanie hails from Northern Alberta and after a couple of years teaching in Singapore, she has repatriated and reclaimed her spot amongst the oversized pick up trucks in the small oil city she previously called home. An avid traveller, she's visited places from Bhutan to Cuba to China to Australia. She's also a good friend of mine and hopped on over to Europe to galavant around Norway with me! Thanks for letting me know about that show. From watching that trailer that is definitely a show I would want to watch and the type of organic traveling I love! Ooooh this show looks awesome! Oh Departures. How I miss that show.